To determine the correct hat size for you, measuring your head is most accurate. Find a measuring tape, or a length of string that you will hold up to a tape measure to determine the length. Place tape or string just above your ear, about 1/8". Continue across the middle of your forehead and around until it completely encircles your head. Make sure that the tape or string is tight, but not tighter than you would want your hat to fit. If you find that your size falls between two sizes, choose the next one up. 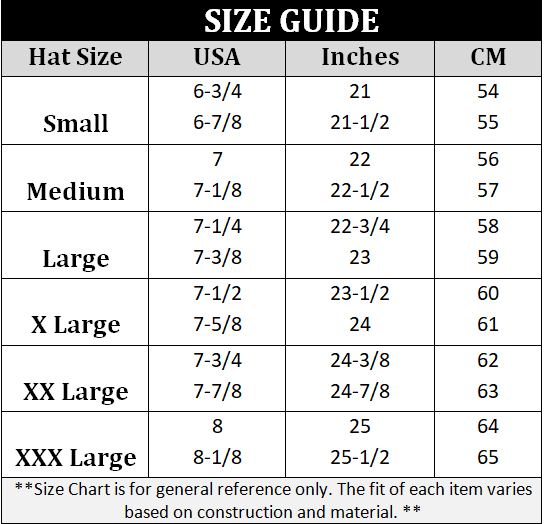 Alternatively, if you already own a hat, check its size and refer to our chart above. While hat sizes are technically universal, they may vary from manufacturer to manufacturer, so we cannot guarantee that these methods will produce an absolute fit. One Size Fits Most (OSFM /One Size) generally fit up to XL or 7-5/8.